Red Mulberry growing tree of the genus Murus, Red Mulberry perennial deciduous plant, grow in temperate, subtropical or mediterranean climate and growing in hardiness zone 5-10. Flower is white and small, the flowers grow in groups that connected to each other in cone shape, there are female and male flowers that grow on separate trees. Mulberry fruits assembled from small cells (fruit) that make cone shape 2-4 cm. The mulberries color: red, light to dark purple dark. 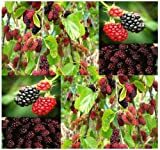 HOO PRODUCTS - 200 Mulberry tree seeds Morus Nigra fruit seeds in Bonsai, sweet mulberry seeds for home garden plant Mix color(Red and black) Hot Sale! What can be done with big quantities of Red Mulberry fruits?